While learning to apply an Agile mindset, I wanted to answer the question ‘how do I reconcile the business’s expectation of predictability with the spontaneity a team needs?’ For example, the business desire to commit early to a launch date clashes with the team’s need to plan much shorter term. Although Agile – a mindset to manage uncertainty – satisfied my quest for an answer and best practices, I decided it was not enough. “People first” does not support preassigned team roles (e.g. Product Owner, Scrum Master) and “give and take” dynamic is only partially accounted by ‘satisfying’ or ‘collaborating’ with the customer. How is Elastic Tribe different from Agile? Elastic Tribe is the link between experiments (business) and spontaneity (team). Experiments are small, frequent impact changes supported by a build, measure, learn feedback loop. For instance, development of an experiment in one or two Sprints, will be followed by one Sprint of data informed decisions, and another Sprint to make further improvements. Team spontaneity emphasizes the mindset to adapt to change to deliver successful experiments. Think about how a jazz band improvises around an emotion to deliver music. Elastic Tribe is best suited for ambitious and non-hierarchical organizations that want to be proactive rather than reactive. To execute a proactive approach, team members must adapt to constant change backed up by a culture that embraces uncertainty and prioritizes people first. Projects are ultimately temporary knowledge endeavours led and influenced by people. In my experience, how people behave and interact has a greater impact than “owning” or “managing” schedules. A process should always fit the needs of the team and the project. Therefore, first promote a culture or understand deficiencies, and then propose a bespoke process. Sometimes in fast paced projects, balancing conversations against document creation and maintenance is an art. In general, bespoke light processes can be complemented by driven and self-managed team members that have collaborated with peers across teams and/or have a product T-shaped knowledge (breadth and depth). In an ecosystem where users can and will change sides very quickly there is an urgency to adapt quickly. If your technology pipeline does not support continuous deployment, or your organizational structure has many layers and isolated teams, your brand may be at risk. Remember that your direct competitor is yourself, not others – only you can change course. Therefore, think more about how to improve internally versus matching the competition’s latest new feature addition. Avoid the temptation to add more layers on top of existing complexity because complexity will increase. To remove complexity promote integration and empower people. For example, promote temporary and autonomous cross-disciplinary teams (e.g. design, engineering, marketing) with a clear purpose – have you used impact maps? Achieving predictability is a challenge in a digital world where users easily access information, engage with new networks and switch between brands. Do you think 5 year plans remain an effective tool? 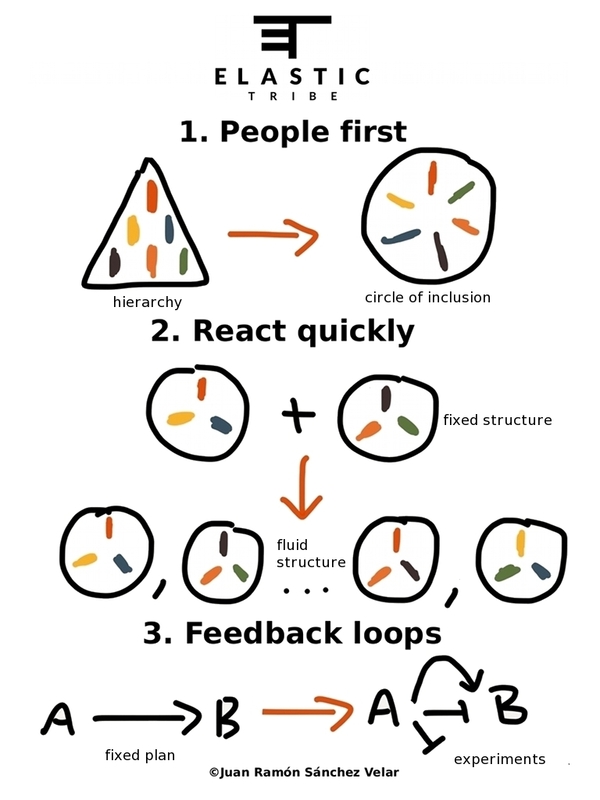 Instead, small, frequent impact changes supported by a build, measure, learn feedback loop is the secret sauce. This is the premise of continuous delivery. Adding more features is not the solution – habit forming design is the new Pandora’s Box. Have you thought about what user behavior you want to turn into a habit? When thinking and talking about Elastic Tribe, my interests have shifted with time to new topics of interest like neuroscience or applying principles of chaos theory to better manage the non-linear nature of projects. Have your interests changed while learning to apply an Agile mindset? Thank you for your first visit! In all blogs I intend to think differently and challenge traditional ideas. I am in fact glad to read this blog posts which carries tons of valuable data, thanks for providing these data. Great to read that you enjoy the blog! Thank you for your comments. Happy to read you are having fun!